It's an easy five-minute walk. But if you're loaded up with sand-castle shovels and buckets, you can catch a complimentary ride with the bellman. Ball machine workouts, private lessons, player matching and a junior program for kids of all ages, from toddler to teen. Fodor's has declared it one of the best. And based on their protests when it's time to go, it seems Hanalei Bay's kid-guests wholeheartedly agree. Jot down everyone's kayak, paddleboard or other beach toy order and visit the Activities Cave by the main pool to line up rentals. Listen to the birds chirp and waves rolling in, as you soak up the views from your private balcony. 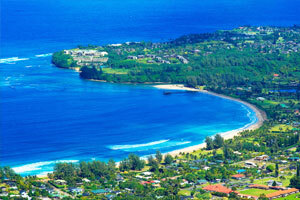 The biggest thing in town is the soothing waters of Hanalei Bay. Every time you step outside you're greeted by dramatic rainforest cliffs. From distant mountains to dramatic ocean vistas, this tropical north shore escape has so many amazing views. Spread out across 22 acres of lush gardens, Hanalei Bay Resort shares a pristine stretch of sand with the neighboring St. Regis. It’s an easy five-minute walk to the beach – but first, stop by the poolside Activities Cave so staffers can arrange to have everyone’s kayaks or paddleboards ready for when you get down to the water. Tennis buffs of all ages will want to head for the 8-court Peter Burwash tennis facility for lessons, daily clinics, mixers, and more. Reward yourself for that impressive win with an afternoon at the waterfall-filled, lagoon-style pool overlooking the bay. And don’t miss the hot tub carved into the volcanic-rock grotto. Recover from the day’s adventures in your spacious vacation studio or one-bedroom. Both feature full kitchens with stainless steel appliances and granite countertops. Have the kids set the table on the lanai. You won’t hear a word of argument from anyone for suggesting dinner outside, where you can watch the sky turn 23 shades of pink and purple as the sun sets. It’s not too early to start planning the rest of your stay. The onsite concierge team is happy to assist with pineapple plantation trips, luaus, surf lessons, and more. Guests who may encounter issues with stairs should contact this property in advance to request a room on the first floor. Elevators are not available. Contact the office using the information on the reservation confirmation received after booking.